Detailed listing of our Thomas & Betts Crimpers. 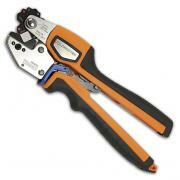 Rotating, embossing crimp head, delivers a wide installing range of #8-#2 copper and #10-#6 aluminum lugs and splices. Also installs up to green color-coded C-taps and MD2 Series motor lead disconnects. The TBM45S lug crimping tool, has a rotary color-coded die wheel and is equipped with a ratcheting Shure-Stake device (to ensure positive compression). 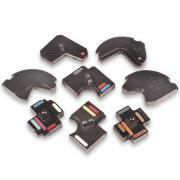 This Thomas & Betts crimper has a 5-nested die wheel with red, gray, blue brown and green Color-Keyed lug nests. This tool also automatically embosses the corresponding die code onto the crimped connector, thus documenting a proper crimp. Ergonomically designed handle delivers comfortable crimping which requires 25% less handle force to complete the crimp cycle than the previous generation tool. The TBM45S Lug Crimper weighs 1.5 lbs and is 10 1/4" long. 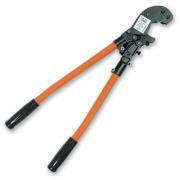 Compact, manual hydraulic crimper handles lugs and terminals to 900 MCM, Copper "C" Taps and Aluminum "H" Taps. The TBM14M self-contained hydraulic crimping tool installs copper and aluminum color-keyed connectors; copper and aluminum lugs and two-way connectors up to 750 MCM; copper "C"-taps through #54775; aluminum "H" taps through #63150 plus grid connectors through 250 MCM, 5/8" rod. It features an insulated head for safety, rapid-ram advance mechanism for fast installation, field-replaceable bypass cartridge and short fiberglass handle for use in confined work spaces. The TBM14 develops 14-ton compression force and uses standard T&B 15-ton U-type shell dies (sold separately). Includes carrying case. Connectors with T&B tools are UL and CSA approved as a system. This 17 lb. crimper measures 24.4" in length. Shipping weight is 26 lbs. Thomas & Betts U-Die Sets for this Crimper can be ordered by clicking here. The TBM15 15-Ton Hydraulic Crimper head has a long, slim profile allowing for easier access into tight spaces like cable tray and central office applications. 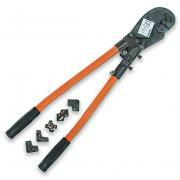 A wide jaw opening (2") allows for easier crimping of larger lugs, C taps and H taps. 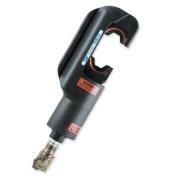 This 15-ton hydraulic crimper with insulated, non-self-contained hydraulic head can be used to install copper and aluminum lugs and splices up to 1000MCM, C taps, H taps and grid ground connectors. It runs off of standard 10,000-psi hydraulic pumps (Click Here to go to pumps). 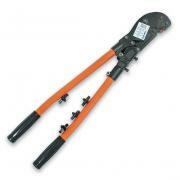 This 15-ton capacity crimper has an open yoke C-style insulated head. It crimps connectors through 1000MCM, C taps and the big 750MCM H taps. Uses interchangeable dies (sold separately). Includes 3/8" male, screw type coupler and carrying case. The TBM15 Crimper head weighs 14 pounds (without dies). Jaw opening is 2" and 1.5" with die adapter. 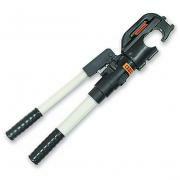 This T&B crimper is engineered for rugged use and long life and is backed by a 5-year warranty. The T&B 15-ton head is for use with P-style dies only. Adapter #39240 is required when using "U-style" dies with this tool, adapter shown below. Click here to see our selection of Crimper Dies for this tool. Click here to see the T&B Hydraulic Pumps to drive this crimper head. The TBM8 installs code copper lugs and connectors from #8 to 500 MCM; all code copper compression joints and "C" taps; aluminum lugs and connectors from #10 to 350 MCM plus Blackburn compression lugs and connectors. Includes color-coded installing dies, Shure-Stake device (to insure positive compression) and carrying case. Tool weighs 20.5 lbs and is 26" long. The TBM5 installs copper conductors from #8 to 250 MCM lugs, splice joints and taps plus aluminum cables from #10 to 4/0. Includes dies and Shure-Stake device (to insure positive compression). 9.4 lb crimper measures 26". Use the TBM6S crimper to install #8 through 500 MCM color-keyed copper lugs, splices and taps; #10 through 350 MCM color-keyed aluminum lugs and splices plus 63105 through 63140 orange, green and blue H-Taps. TBM6S includes Shure-Stake device (insures positive compression), wire brush and carrying case. This 21 lb. crimper is 26" in length. Dies are sold separately.